Richmond to Danby Wiske; a bit over 15 miles the way we went. See photo of Richmond Castle and River Swale from the start. Another 8.40am start, another dry warm day. We planned to stop at the pub at Catterick Bridge but thought 10.50am was a bit early for a beer. We carried on to the Farmers Arms at Scorton. Unfortunately, we were too fast and arrived at 11.45am; maybe that was the Olympic influence! The pub opened at 12am. We sat in the sunshine until opening time. Both of us had Copper Dragon Golden Pippin. 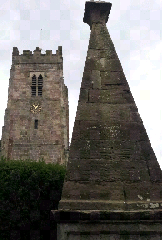 Next stop was the churchyard at Burton on Swale to see the monument to Henry Jenkins who lived to be 169 years old in the 1500’s and 1600’s. That’s a long time! See photo. From there it was farmland, cows and crops to Danby. The only muddy section on the whole day being the last mile to Danby. We finished at 3.15pm at the White Swan. First off was a Northallerton Dark Ale, a bit sweet for me but the Yorkshire Dicky Edge was a good pint. So, just a short day to end a great trip. The waterproofs were only used for 10 minutes in 5 days and the walking was good. Thanks to Al for his company and keeping me entertained, even when he didn’t realise it! I have some new landscape, waterfall and other photos. It may take me a while to get to them though as my new book, City Light, will have to take precedence. We managed a creditable 17 mpg (beer!) over the 73 miles that we walked in 5 days. So that’s 10 days down. Next year we return to Danby Wiske to walk the 4 or 5 days to Robin Hood’s Bay to finish the walk.